A while back, I wrote about one of the most common ways of making electric light: fluorescent bulbs. Understanding fluorescent lights requires quantum mechanics! While a lot of quantum physics seems pretty removed from our daily lives, it's essential to most of our modern technology. In fact, reading what I'm writing requires quantum mechanics, since you are using a computer (maybe a handheld computer like an iPad or smart phone, but it's still a computer) or a printout from a computer. Modern electronics, including computers and phones, depend on semiconductors. Conductors (like the copper wire in power cords) let electricity flow easily, but semiconductors conduct electricity more reluctantly—but that very reluctance lets us control the flow. While they can't sustain large currents like conductors can, we can tinker with the chemistry of semiconductors to make them conduct electricity in very precise ways. One of those ways lets semiconductor devices make light: those are known as light-emitting diodes, or LEDs. You likely have many LEDs in your home: they're common as indicator lights on appliances, and you might even have LED light bulbs. While they're pretty expensive right now, the price of LED lights is getting lower all the time, and they have major advantages over both incandescent (old-style) light bulbs and fluorescents. They won't burn out even as quickly as fluorescent lights (themselves longer-lived than incandescents), and consume less energy. Since they are based on solids rather than gases, they're not going to break easily, either! But how do they work? When I described fluorescent lights in my earlier post, I described how atoms have distinct energy levels inside them, and light is produced when electrons move between those energy levels. Fluorescent lights use gases (generally mercury vapor), so the atoms are relatively widely separated. In solids, including semiconductors, atoms are tightly packed together, forming bonds that don't break without high pressures or temperatures. In fact, they may also share electrons with each other; a particularly dramatic example of this is in metals, where the electrons in the highest energy levels of the atoms all form a gas that surrounds the atoms. That's why metals are such good conductors—a little push from a battery or other power source makes those electrons flow in one direction (on average at least), much as a fan creates currents in the air. Semiconductors are a bit more complicated: their electrons are loosely bound, but still stuck to their host atoms. The way physicists understand this is something known as the band model: just like atoms have energy levels, solids have energy bands. Low energies correspond to electrons stuck to their atoms, which can't leave; we call these closed shell electrons (for reasons that aren't important for this particular post). Moderate energies are known as valence electrons, which stay put ordinarily, but can be persuaded to move if given the right incentive. Finally, high energies are conduction electrons, which aren't tied to a particular atom at all; as their name suggests, they are the ones that carry electric current. Whether a solid conducts electricity depends on its band structure, and the size of the energy barrier in between the bands, which is called a gap. Large gaps require large energies for electrons to jump them, while smaller gaps are more easily jumped. Conductors have negligible gaps between their valence and conduction bands, while insulators have huge gaps. Semiconductors lie in between; adding extra atoms to a semiconductor can make the gap smaller (a process known as "doping", which sometimes makes describing it unintentionally funny). At low temperatures, semiconductors may not conduct electricity at all, since no electrons can jump the gap into the conduction band. Either warming them up a bit or applying an external electric current gives the electrons the energy they need to move into the conduction band. 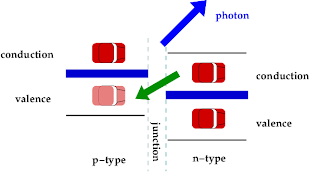 One more complication: there are two types of semiconductors, known as n-type and p-type. 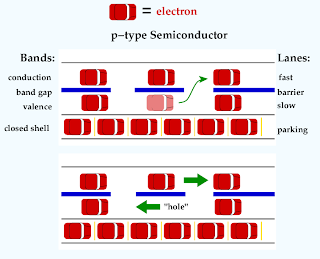 In n-type, just a few electrons (cars) have access to the conduction band (fast lane) at a time, but in p-type, enough electrons get in to leave holes in the valence band. Applying a current to the semiconductor shifts another valence electron into the hole, but that leaves another hole, and so forth...so it looks like the hole is moving! In fact, physicists refer to this as "hole conduction", which also sounds odd if you're not used to it. Now we're finally ready to understand LEDs. If you join an n-type semiconductor to a p-type semiconductor, you make something known as a diode. (The prefix di- refers to the number two. If you join three semiconductors, you get a transistor of either the pnp or npn types, depending on the order you use.) 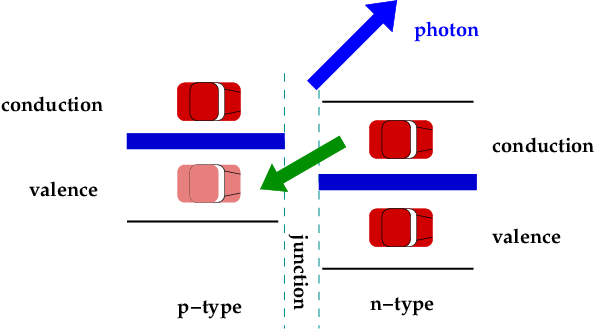 The bands (lanes) don't line up perfectly at the junction: the conduction band in the n-type is generally only slightly higher than the valence band of the p-type, so just a little nudge is needed to move electrons across. This means when they reach the junction between the materials, electrons from the n-type semiconductor can fill the holes on the p-type, which is a decrease in energy. Just as in individual atoms, moving from a higher energy level to a lower energy level makes a photon—and that's where the LE in the D comes from! LEDs tend to produce very pure colors, rather than the mixture of colors our eyes perceive as white light. To create LED light bulbs, generally blue LEDs are coated with a phosphorescent material, much like the kind used in fluorescent bulbs. Unlike fluorescents, though, there's no gas involved, and less heat is lost (though there is still a little bit). Together these factors make LED light bulbs longer-lasting and more efficient even than fluorescents, though currently they are far more expensive. Despite how common LEDs and other semiconductors are, they're considered fairly advanced physics. But guess what: if I did my job right, you should understand LED physics now! What is often thought of as "advanced" is really everyday science, and it's a part of how quantum mechanics (with all its electrons and fascinating interactions on the microscopic level) has helped create our modern world. my friend said that halogen lamp flashlight is good to use in hiking specially when there is fog compared to LED lamp flashlight. Did your friend give a reason for this? I suspect the reason is in brightness, not the nature of the bulb itself: most LED flashlights aren't as bright as halogen bulbs, which can be very bright (though they consume a lot more power). Phantastic!!! - the best and shortes, easyest comprehendable explanation I have ever seen. I could not think of a better way to explain the workings of an LED to my grandsons (aged below 10).